We’d love your help. 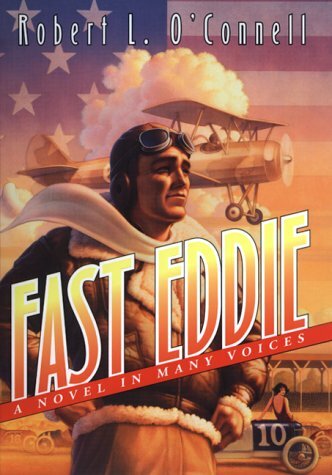 Let us know what’s wrong with this preview of Fast Eddie by Robert L. O'Connell. To ask other readers questions about Fast Eddie, please sign up. Readability 2, informative a 5 so settle for a 4. Many of the "My friends call me Rick" Stories I have read before in other Books but enough new material to make me both laugh or think depending on the paragraph. An entertaining almost-biography about Eddie Rickenbacker, a man who would challenge the Dos Equis guy for the title of the most interesting man in the world. Robert L. O’Connell was educated at Colgate University and the University of Virginia, where he received a Ph.D. in history. He worked for three decades in the U.S. Intelligence Community, before becoming a Visiting Professor at the Naval Postgraduate School in Monterey California. He has two grown children and lives with his wife in Charlottesville, Virginia. He is the author of six published hist Robert L. O’Connell was educated at Colgate University and the University of Virginia, where he received a Ph.D. in history. He worked for three decades in the U.S. Intelligence Community, before becoming a Visiting Professor at the Naval Postgraduate School in Monterey California. He has two grown children and lives with his wife in Charlottesville, Virginia.